We’re fans of MotoGP racing. We’re also fans of infographics. Combine the two with the fact that we’re illustrators by trade and you’ve got yerself these info-packed visual aids. 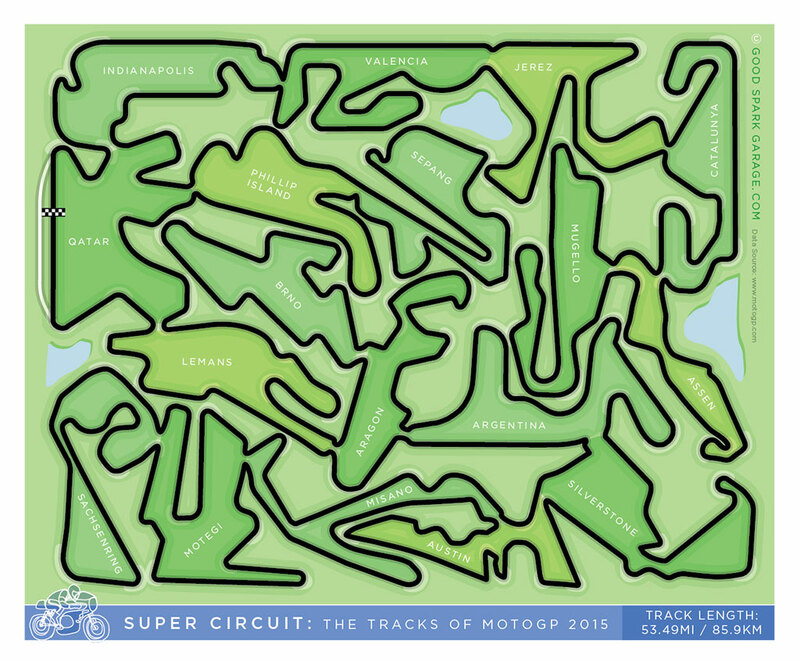 The lead image is a fantastical imagination of what a circuit may look like if you combine all of the MotoGP tracks in the 2015 Championship into one Super Circuit (we can dream). 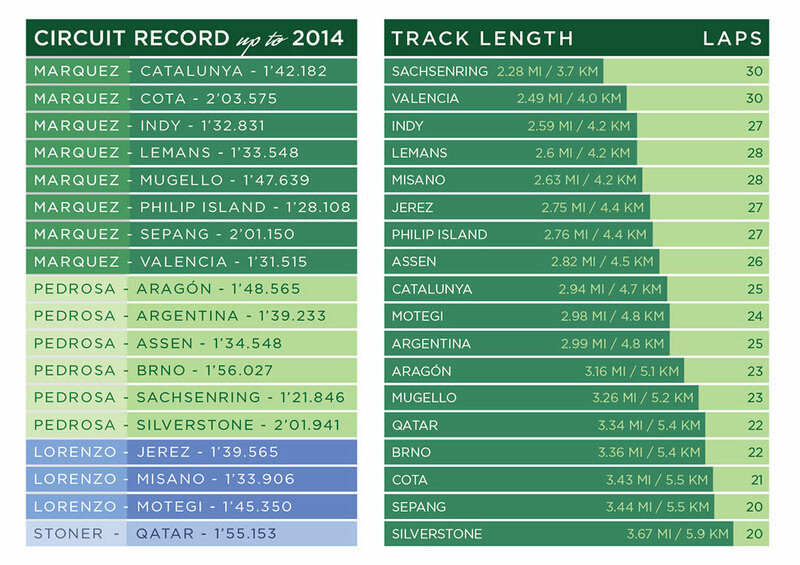 Using info gleaned from MotoGP.com, we’ve assembled some interesting stats and posted a visual calendar of the 2015 season below. There are some heated battles going on in Moto3 and Moto2 and some exciting story-lines going on in the MotoGP class. 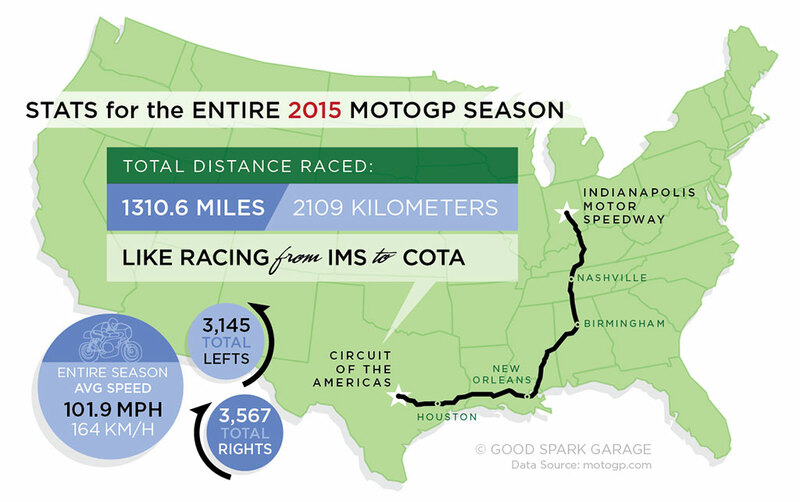 The infographic above represents the total numbers if all the races were combined; imagine racing the best motorcycle racers through more than 6500 turns! Tight turns vs. a flowing layout will create a big difference in speed. Riders love the Australia’s Philip Island for its fast turns and get a workout at the season-ending Valencia in Spain, (the Circuito de la Comunitat Valenciana). If you want to share or pin the entire grouping of infographics, grab the image below and link back to www.GoodSparkGarage.com. If you end up at the Red Bull Indianapolis GP, maybe we’ll see you at the Speedway. HA!… that is super cool. The next step is to get with a video game developer and turn your mega-track into a digital reality. Right! Heck, I’d play that game.